The site of a proposed bottling plant was underlain by old municipal waste dating back to the 1950’s. Much of the five-acre waste site was incinerated material. 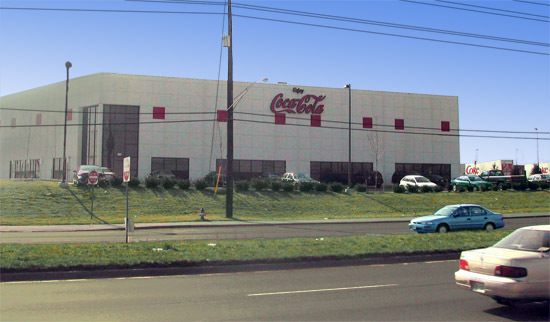 TerraSystems had performed dynamic compaction on the site in the mid 80’s for self-storage buildings and the performance of the structures had been exemplary for over a decade prior to development of the CocaCola Plant. Due to the extremely high costs associated with a pile foundation system for the foundations and floor slabs, and the prior favorable experience with dynamic compaction at the site, it was determined that dynamic compaction was the best option for developing the site. TerraSystems used a 15 ton weight dropped from heights of approximately 60 feet to compact the waste material. Locally-available silty sand and sandy silt was used for most of the crater backfill. An eight ton weight was used to “iron” the site after high-energy treatment. After completion of dynamic compaction, approximately 10 to 12 feet of structural fill was placed to raise the site to the desired final grade. The settlement of the site was monitored for several months. Post-construction monitoring indicated no detrimental settlement of the foundations or floor slabs.